March Madness takes over Minneapolis for the Men’s NCAA Basketball Final Four from April 6 – 8, 2019. Aside from all the exciting tournament-related activities, the experts at Meet Minneapolis have fans covered with culinary adventures and unique cultural highlights not to be missed should you make it to town. Since the early 1960s, Minneapolis’ skyway has grown from one connection between two buildings on the second floor, to more than nine miles of every establishment you can imagine – banks, gyms, beauty salons, doctors, and a theater just to start – offering access to 140 different dining options for coffee, dining and happy hours. 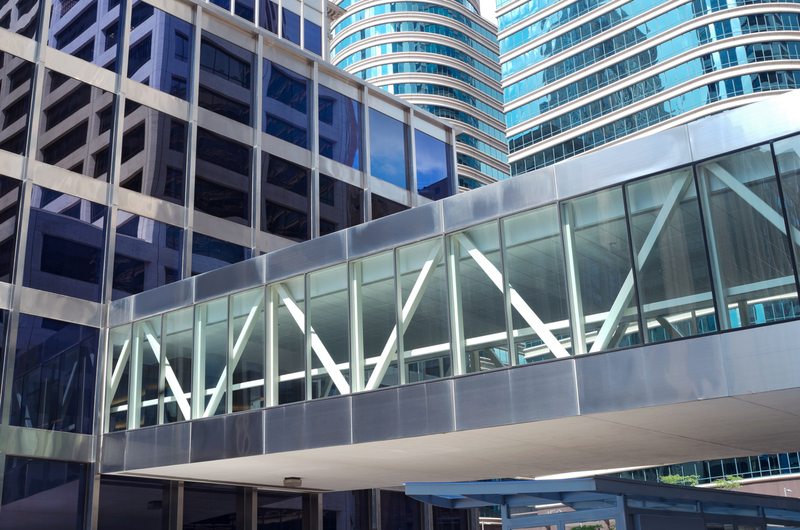 The world’s largest contiguous system of connected, second-level bridges are an amenity for all that offer space for exercise and walking, too. The skyways do not have uniform hours so be sure to watch on posted signs; each skyway is owned privately. Enter from the street and head to the second floor of most public buildings to get into the system and then go! Maps and signage are throughout and if you don’t know where to go next, just ask someone: Minneapolis folks are “Minnesota Nice” and happy to help you find your way. Best of all, you can leave your coat in your room when you’re traveling in the skyway system: it’s mostly 70 degrees Fahrenheit all year round. 2. Get lost in exhibits at the Walker Art Center on First Free Saturdays and every Thursday night. 3. Take a walk through the Sculpture Garden at the Walker Art Center and take your photo with the iconic Spoonbridge & Cherry (pictured above). 4. Explore at the Guthrie Theater and enjoy the view of the Mississippi River and St. Anthony Falls from the Endless Bridge or the Amber Box. 5. 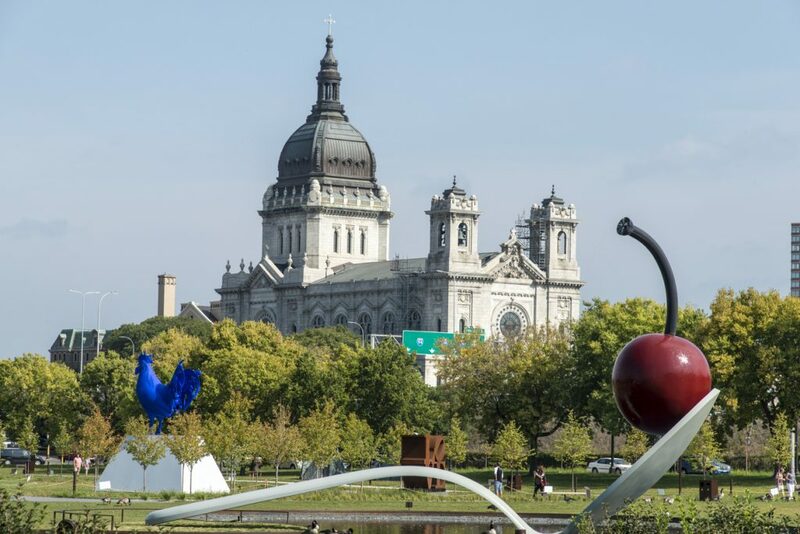 Explore Minnesota’s largest art educator, the Minneapolis Institute of Art, which is free and open to the public daily. 6. Stroll the Mill City Farmer’s Market and take in free entertainment and fun shopping on the riverfront on Saturday mornings. 7. Stop for ice cream at Izzy’s, a local favorite all year round. Don’t forget your Izzy’s scoop! 8. For a small fee, visit the Foshay Observation Deck and Museum and get the only outdoor skyscraper view of the city of Minneapolis. 9. Shop from local and diverse businesses and have an inexpensive lunch at the Midtown Global Market. 10. Enjoy a free brewery tour at Insight Brewing every Saturday. 11. Play in one of Minneapolis’ 197 parks, the number one park system in the country for six years (ParkScore). 12. Browse the boutiques in the hottest neighborhood in the country, the North Loop neighborhood. 13. Shop and get free visitor advice and ideas at Meet Minneapolis Visitor Center on Nicollet & 5th Street. 14. Visit the Weisman Art Museum and get a tour. Both admission and weekly tours are completely free! 15. Attend Slay Day/Backyard Party at Surly, Minneapolis’ first and only destination brewery, on Sunday, April 7 from 11 a.m. to 4 p.m.
16. Eastside: Nationally lauded Chef Jamie Malone took over this three-year-old Mill District spot in 2018, re-doing nearly everything from world-class cocktails to family-style, yet internationally accented New American dishes. With the Malone team touch, it’s sure to be as big a hit as her Grand Café redux was in South Minneapolis. Guthrie patrons may want to try the pre-fixe theater menu and rest easy knowing the valet will keep their cars until final curtain. 17. Popul Vuh/Centro: There are two sides to this hot new Northeast Minneapolis restaurant: Popul Vuh serves elevated Mexican cuisine influenced by Chef Jose Alcon’s travels alongside craft cocktails featuring mezcal and tequila. Adjacent Centro is where Alcon contrasts Popul Vuh’s refined dining experience with street tacos, pitchers of margaritas and a raw bar. 18. Demi: James Beard Foundation Best Chef: Midwest 2018 Gavin Kaysen will opened a 20-counter seat tasting restaurant behind his still popular Spoon & Stable, with a focus on seasonal ingredients served on handmade pottery. Short for “demitasse” (meaning “little spoon” – again, he loves spoons), this former coffee factory is a family affair with his wife designing the décor and his brother hand making some special furnishings. Octopus “civet” is a dish inspired by Chef @gavinkaysen’s time spent in Lyon, France, specifically while dining at The Paul Bocuse Restaurant. This delicious twist on a time-honored French meal is just one of the many dishes created with a significant memory at the core of it. 19. Bus Stop Burgers & Brewhouse: Newly opened in the neighborhood near U.S. Bank Stadium, the retro bus décor includes actual vintage busses on the interior and on the patio that will open this spring, and a counter-service menu marrying blended burgers, fresh homemade pies (with The Lynhall’s bakery) and beer infusions. 20. P.S. Steak: Near the Walker Art center, Minneapolis’ newest, upscale steak restaurant also features craft cocktails that are listed on an entire “Respects” page of the menu honoring the past bartenders (many who still work all over town) who put the city on the map from behind the bar in the elegant lounge. Chef Mike DeCamp has created an homage to the French restaurant, La Belle Vie, which famously occupied this ”see and be seen” spot. 21. Colita: Billed as Tex-Oaxacan, Chef Daniel DePrado integrates the diverse cuisine of Mexico with barbeque and smoking techniques from around the world while focusing on the moles and flavors of Oaxaca. The gluten-free kitchen also hand grinds organic Oaxacan corn daily and cooks to order fresh tortillas. 22. Mevyn: Aiming to be all things to all people, they begin with wood-fired bagels, add small plates that include shakshouka and hummus, matzo ball soup, and latkes and round it off with dishes like fried chicken with Israeli hot sauce in an all-day menu that encourages community and use of their South Minneapolis space morning to night. 23. Hai Hai: Much has been said about this Northeast Minneapolis meets Southeast Asia street food spot, and it’s all true. The menu was inspired by Chef Christina Nguyen’s experiences growing up in a Vietnamese family and her trips to Southeast Asia, and she shines a spotlight on lesser known regional dishes and flavors. 24. Market BBQ: For more than 70 years, Market BBQ pit smoked spareribs, pork and brisket on Eat Street, attracting fans from all over the country. When progress in the name of demolition gave them a reason to find a new home, the family-owned joint salvaged all the décor, neon signs and walls of memories and brought them to Northeast Minneapolis’ Lowry Avenue. If you hadn’t crossed the river, you’d never know you weren’t in the old restaurant’s wooden booths filling up on comfort food. 25. PinKU Japanese: Daily fresh fish and produce prepared in an open kitchen in the spirit of Chef John Sagimura’s immigrant obaasan (grandmother) with the values of harmony, respect, purity, and tranquility promote the true spirit of Japanese cuisine and traditional sushi. And the small, curated menu is prepared with the certified “Silver Standards” of Japanese cooking that uphold the values of traditional Japanese cuisine, known as washoku, right in Northeast Minneapolis. 26. Tattersall Distilling: Their popular cocktail room in Northeast Minneapolis buzzes with people enjoying the new drinks that reflect the seasons and new combinations with names like Blood & Snow and Innuendo #2. 27. Surly Brewing: While their food hall and pizza restaurant are great reasons to stay, what draws the crowds to this landmark destination brewery time and again are the beers: Surly Furious, Surly Hell and Axe Man are among the memorably named pints. 28. Royal Foundry Craft Spirits: Minneapolis’ newest “grains to glass” distillery brings British flavor and traditions to the northside using grains, botanicals and classic recipes. In addition, there are three Skittles lanes (9-pin bowling), plus plans to build a 100-seat deck overlooking a cycle speedway for British-style cycling leagues. 29. La Doña Cerveceria: Fusing authentic Latin beers with The North, La Doña’s brewery and taproom encourages the Latinx community, and all others, to join the fun. This craft brewery has a 3v3 soccer field on its patio and the UR/IN art gallery on the way to the restrooms. 30. Number 12 Cider House: Minnesota’s largest cider house opened recently in the North Loop neighborhood with 16 lines of ciders that pair perfectly with the Little Tomato wood-fired pizzas you can grab outside in a brick oven truck seven days a week. 31. Volstead’s Emporium: This basement speakeasy hidden away off West Lake Street is so secretive their website does not give much away except the hours. The secret is finding the red light and peep-slotted steel door to get a chance to enjoy the affordable Prohibition-style cocktails. Artfully crafted, delicately balanced. Each cocktail is expertly made with house recipes, syrups and bitters. Cheers to the weekend! 32. Finnegan’s: Brewing Finnegan’s beers for more than 18 years, they opened their first taproom, brewery and club space that is also a social business incubator + accelerator and community workspace in 2018. They’re also the world’s first beer company that donates 100 percent of their profits to charity. Fill your growler for $8 all day on Friday's at @finnegansbeer; yet another reason to convince your coworkers to stop by our taproom after work. 33. Modist Brewing: Teaming up with local Rise Bagel Co. and Twin Cities Food Justice, Modist is grinding up left-over bagels to create a collaboration brew, No Bagel Wasted, in an effort to combat food waste. 34. Eastlake Brewery and Tavern at Midtown Global Market: This brewery serves beer, sure, but what’s unique is they’re serving up growlers of kombucha in flavors like peach, ginger and tropical for a healthier alternative that pairs nicely with the diverse food offerings in this food hall. 35. Marvel Bar: A mixologist has been making avant-garde cocktails like the Stockholm Syndrome and Two-Dollar Bill in this subterranean, unmarked, yes, speakeasy-like bar beneath one of the hottest restaurants in town for years. Good taste never goes out of style and Marvel Bar remains one of the most popular unknown bars in town. Don’t miss your “one shining moment” to attend the 2019 Final Four in Minneapolis, and enjoy all the activities the city has to offer outside the basketball court.